The 6.6L LML is the latest version of the Duramax engine that is used in heavy duty pickup trucks. This engine essentially replaced the LMM starting in 2011, largely due to the introduction of more stringent emissions standards. The LML was introduced at the same time as the LGH and with similar hardware, but the LGH is a detuned version of the LML that was primarily foreseen for work trucks and vans, including more PTO options. The LML Duramax engine is technically produced by DMAX Ltd, which was founded from a joint venture between GM and Isuzu. That being said, all Duramax engines are only installed in GM vehicles, and the design and development is all done by General Motors, as DMAX is strictly the production side. The LML has been solely used in pickup truck applications, namely the GMC Sierra and Chevrolet Silverado. As mentioned, the LML was primarily targeted for the new emissions standards, for which the main difference was a significant decrease in NOx emissions. To combat this, the LML, along with the LGH, were the first engines to use selective catalytic reduction (SCR) systems for the Duramax engines, while also carrying along the DPF introduced with the LMM. New Piezo fuel injection system along with a new turbocharger, improved block design, and several other features help the LML provide increased power over the LMM it replaced. The engine was first produced in 2011 and was placed in the GMC Sierra and Chevrolet Silverado, and the LML has not yet been replaced. This engine is popular for its impressive power, particularly in towing situations. Another very popular feature is the exhaust brake that is built into the turbo. This can be used to save your brakes when going down steep inclines with heavy loads, and has proven to be superior to similar offerings from the competition in head to head comparisons by 3rd parties. The LML is a strong performer, with maximum horsepower for the V8 turbocharged engine reaching 397 hp at 3000 RPM and 765 lb-ft at 1600 RPM. This is an additional 32 hp and 105 lb-ft of torque over its predecessor, the LMM. The 6.6 L displacement, or 403 cubic inches for the traditional guys, is achieved through a bore of 4.06 inches and a stroke of 3.90 inches. Similar to its predecessor, the Duramax LML uses a cast iron block to go along with a cast aluminum cylinder head. The crankshaft and connecting rods are constructed of forged steel, with the connecting rods being stress fractured. The intake manifold is cast aluminum. The valvetrain utilizes a steel camshaft in the block with pushrods controlling the overhead valve system. There are 4 valves per cylinder, 2 intake and 2 exhaust. This gives a total of 32 valves for this V8 engine. 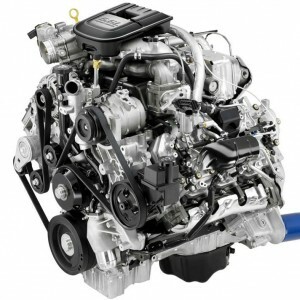 The LML Duramax engine was introduced in 2011 along with the new requirements for meeting stricter emissions standards. This replaced the LMM, which had been in production for 4 years, and the LML was introduced with significantly greater performance values. Despite only 4 years between the introduction of the LML and the LMM, the LML was able to provide an addition 32 hp and 105 lb-ft. This was the first engine from General Motors offered with SCR technology to combat the increased NOx emissions, and the SCR requires that DEF (Diesel Exhaust Fluid) be added to the engine. This is additional hassle for the customer, but is one shared across the Diesel community until a technology can be introduced that can reliably and efficiently reduce NOx emissions, particularly with the high loads required by this type of engine.